THIS BLOG would be nothing without you, its friends and supporters: thank you for all your encouragement over this past year. Click on through to farmafricapresents.org.uk and you’ll be able to watch a video that tells you all about Farm Africa’s work — and, I hope, you’ll be inspired, to buy a goat for someone else. Don’t worry if a goat’s not your thing: you can always send a beehive, a camel, a chicken or something more quirky such as a bottle of fermented cow’s urine. This in many ways marks the official start of Durham Staff in their fight for Justice against the Brewer Brothers and their tactics of playing fast and loose with employment law and the rights of workers to be treated fairly and dismissed in a right way. However Durham Cathedral itself via their trading arm are also in the dock as it were, again something that may not come as any great surprise to readers of this blog who have at times been dismayed, upset and hurt by some of the Cathedrals inactions and actions throughout the saga. CATHEDRAL bosses could become embroiled in a complex legal fight after bookshop staff launched tribunal proceedings. Six workers at Durham Cathedral’s bookshop are seeking compensation after their employment was allegedly terminated when the shop unexpectedly closed on January 22 this year. But confusion has arisen over who is potentially liable for any payouts and proceedings have been listed against several different companies, including the cathedral’s trading arm, Durham Cathedral Trading Ltd.
Miss Jeram, representing the Trust, (inserted clarification for blog readers – that’s SSGCT) said: “There are a number of uncertainties. There has been a great deal of confusion right from the beginning over their employer. “The only issues can be who the employer was immediately prior to the closing of the bookshop and who the employer was at any time after that, in the period between January 22 and March 1. Claims against employers involve redundancy pay, unfair dismissal, breach of contract and unpaid work. Sara Brody, representing the staff on behalf of shop workers union Usdaw at the hearing, argued the Trust should remain on the list of potential employers. Last year Durham cathedral bosses served SSG notice to vacate the shop, the last in the UK to be involved with the Trust, by May of this year. Again these issues as raised are nothing new to anyone aquainted with this situation, previous tribunal actions and this blog. So again we would ask that anyone who has any information, paperwork or correspondence of any sort that could help USDAW and the Durham staff to clear up the issue of employers please do get in touch with them directly. Anything that demonstrates who people believed they were doing business with or indeed were doing business with during the time frames mentioned can all help in proving who the employers were and give credence to the staffs perception of employer, so please do get in touch with USDAW and offer your help to them in making sure justice is again done. As always our thoughts are with those involved in this action and we hope for a swift and just outcome for the Staff at Durham. The complexity of the history of this whole affair, and the deliberate obfuscation introducd by the Messrs Brewer, makes it very difficult for potential creditors to know whether they come within the restrictions laid down, or not. As far as we are aware, the notice has only been published in The Bookseller, while the SPCK chain was a business with worldwide links – far beyond the book trade. How can such a range of creditors can be realistically expected to respond to a notice with a 3 week deadline in a booktrade magazine, posted up to 3 years after the relevant debts were incurred? Does this adequately meet legal requirements for informing creditors? We are not publishing the full text of the letters here until after they have been published in the magazines and newspapers concerned, for obvious reasons. The Interim Manager is in control of the two charities “Saint Stephen the Great”(1119839), and “Saint Stephen the Great Charitable Trust” (1119839-1). The Charity Commission website states that he controls the former, and he has himself declared himself to be in control of the latter when claiming possession of shops. 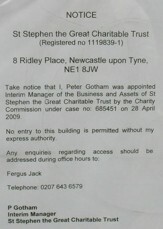 These charities were forcibly merged by the Charity Commission around 23 July 2007. So what is the basis for taking responsibility for actions of one charity only? Shouldn’t creditors of both of these charities be able to seek redress for debts incurred over a far greater period of time? 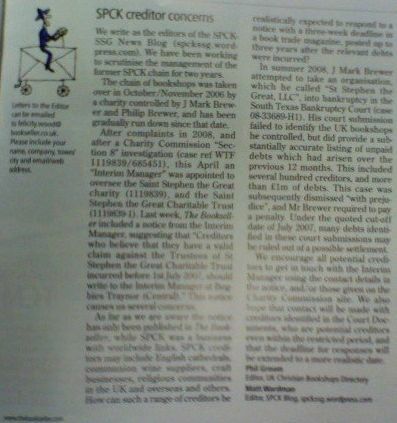 Given the complexity, and lack of clarity, in this history, all creditors, and potential creditors, should get in touch with the Interim Manager using the contact details in the notice, and/or those given on the Charity Commission site; these are stsgct@gothamerskine.co.uk via email, or by phone on 020 7490 1880. We hope that specific contact will be made with the hundreds of suppliers identified in the Court Documents, who are potential creditors even within the period before July 2007. There may be more, as and when we have (or understand) it.